September 19, 2009, Wright-Patterson Air Force Base, Nearly 10,000 runners lined up today at the starting line for the 2009 Air Force Marathon The events included participants running in the full marathon as well as a wheeled division, a half-marathon and a 10K run. The 13th annual running event with an almost 35 percent increase over last year started with remarks by Lt. Gen. Thomas J. Owen, commander of the Aeronautical Systems Center, and included a first-ever visit by an Air Force chief of staff, when Gen. Norton Schwartz arrived to present awards to the winners. 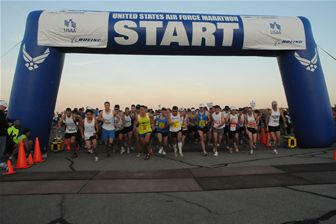 "It's an honor to assist and kick off the 2009 Air Force Marathon," General Owen said. "There are runners from 50 states and eight foreign countries in today's race. There are Airmen who have once deployed and are running today in this year's marathon. I'd like to welcome our guests from the USAF Marathon Team, 2nd Lt. Caroline White, and the Royal Air Force Scampton Running Team from Britain. I also want to thank the more than 2,000 volunteers." 2nd Lt. White ran in the half marathon today to prepare for the 2012 Olympics Trials that will be in Minnesota in October. The three-day event started with a Sports and Fitness Expo at the Ervin J. Nutter Center located on the campus of Wright State University just down the road from the base. The expo ran for two days including a 5K race with more than 1,200 runners to scurry around the college campus on the second day. That evening the marathon runners indulged in a gourmet pasta dinner at the National Museum of the U.S. Air Force. The marathon course went through historical places on the base and through downtown Fairborn, Ohio, where onlookers cheered the race participants. "It was wonderful weather and a great course," said Dave Johnston the winner of the Air Force Marathon with an unofficial time of 2:30:42. "I worked very hard training for this." "I come every year," said Jean Belman from Hazel Park, Mich., has participated in every Air Force Marathon and who served 23 years in the Air Force and Air Force Reserve. "I have to. It improves every year and grows too." This was my first time for this race," said Michael Postell from Atlanta, the winner of the marathon wheel division who races in about 25 marathons a year. "I enjoyed the course. It takes a lot of training to prepare for this event." Seventy-six-year-old Frank Robinson from Louisville, Ky., ran the 10K. "I've been a runner for about 40 years," Mr. Robinson said. "I was here for the second race and now this one. I wasn't going to race, but was talked into it and signed up yesterday. I'm coming back next year for sure." A special runner for the second year was Army Capt. Ivan Castro, an Army special forces soldier who was blinded during a mortar attack in Iraq in 2006. Last year the captain ran the full marathon but opted to run the half marathon this year. Men's full marathon: Dave Johnston from Xenia, Ohio, at 2:30:42. Women's full marathon: Kate Papenberg from Royal Air Force Lakenheath, England, at 3:08:55. Full Marathon, Wheeled Division: Michael Postell from Snellville, Ga., at 1:23:13. Men's Half Marathon: Brent Martin from Gambier, Ohio, at 1:08:44. Women's Half Marathon: 2nd Lt. Caroline White from Colorado Springs, Colo., at 1:22:17. Men's 10k Individual: Chacon Kristoffer from Tyndall AFB, Fla., at 33:11. Women's 10k Individual: Varinka Barbini from Lexington, Ky., at 39:55. Men's 5K: Kory Kennedy from Kokomo, Ind., at 16:50. Women's 5K: Dianne Striebel from Dayton, Ohio, at 19:31.